Things can be beautiful when they begin to fall apart. It is no secret that many of us find unpredictability a very musical thing. Most like it in small doses. Many styles of rock n’ roll are bettered by a player’s utilization of tube-based guitar amp and the breakup they have come to expect from it at certain volume levels. The effect of amp-breakup on the sound of an electric guitar can be a key part of the overall tone. Take a listen to “I’m Slowly Turning Into You” by The White Stripes, or strap in for the entirety of “Dopesmoker” by Sleep. These are just the first two examples that my iTunes offered up, chosen for no other reason than the fact that these songs owe some to their sonic signature to the abuse of imperfections in a signal chain. Although standard practice now, guitar amplifiers were not originally designed to respond in such a way. A shortcoming of design is now a preferable feature. My intention isn’t to champion the virtues of the modern electric guitar, but to support the same attitude toward other instruments and sound generating devices. Perfection and purity will never escape the realm of subjectivity, so why not place value in a bit of ugliness? By testing the limits of a piece of hardware, you allow yourself to be surprised. You also might find that you give a voice to a piece of equipment in an extreme way. An ideal situation finds you at the threshold of visceral engagement where you respond to the gear as much as the gear responds to you. I have only, and will only, ever perform in an era where digital synthesis and manipulation of sound is an accessible option. Sound leaves to digital realm to be heard by us, but there is a very deep reserve of processing options before that stage. There are so many exhausting branches to the analog (hardware) vs. digital (software) debate, and most just get in the way of actual performance. My experience has led me to believe that it IS, however, harder to coax a sense of randomness out of a lot of digital options. The randomness that I’m looking for, an arguably inspiring randomness, is the same sort that can be found in driving hardware past a sensible point of engagement. Do we throw computers by the wayside and instead choose from a selection of hardware and instrument options that time has already deemed acceptable? Not a single one of my peers draws such a thick line in the sand. There’s no need for it, and this musical randomness isn’t always appropriate. What I’d like to suggest, to those individuals who perform with sounds that begin in a digital realm, is to be more adventurous with the exit route of these sounds. They have to enter the world at some point to be heard. What if instead of adopting hardware to reproduce these sounds as neutrally as possible, you place an item in your chain (after the conversion from digital to analog) that’s distinct in the way it interprets the material? Just recently, I had the pleasure of being a part of the Integra Contemporary and Electroacoustics (ICE) ensemble lineup for the Fall 2016 season, and it was a fantastic opportunity to put this idea into practice. Admittedly, my choice to instrumentation started more as a question of “What if?” than a calculated attempt at routing digital sound through an imperfect signal path. When asked to establish what instrument I was going to contribute to the ensemble, I grabbed my Macbook and a Native Instruments Maschine – which is a piece of hardware with velocity sensitive pads, knobs, and buttons used to send MIDI data. With it, I figured I would have plenty of flexibility to trigger and modulate sounds using the partnering Native Instruments Maschine software. Surely I could find a role in the ensemble easily with so many options. I also grabbed an external soundcard to provide analog outputs for my digital sounds. Lastly, I grabbed a cheap karaoke machine I had lying around. The appeal of this machine is that it had two microphone inputs with independent gain controls. These inputs ended up receiving sound from my digital rig. The manner in which this karaoke machine interpreted the sounds I was sending from my computer completely changed my role in the ensemble. This karaoke machine distorted quite easily, and at the most extreme amount of input it would break up in a way that completely obscured the originally timbre of the digital sound. You could “play” the machine, adjusting levels of saturation, clarity and internal noise (a product of a fairly cheap design) by manipulated the two input gain knobs in combination with the master output knob. It was fantastic, and I became very excited to perform with it. Once I understood the characteristics of the machine, I became less concerned with the complexity of the sounds I was using in the digital realm. Stock, pre-packed sounds became a new animal when coaxed through the karaoke monster. At least once per performance my deliberate tweaking jumped sideways into the territory of calf-roping as I jumped to counter a surprising response from the machine. Sometimes the inputs had a poor connection, and signal would drop out until I performed enough of the usual jiggling ritual to bring the sounds back to life. It was an experience that demanded engagement as a performer. Never did I have a free hand. The best part of my instrument was the portion that was falling apart. I invite you to try it out. Even within the bounds of conventional playing, the timbre of each individual guitar player’s tone varies vastly more than the players of any other instrument. While any instrument’s timbre can widely vary depending on things like material, mouthpiece or reed, or the room it’s being played in, the variables increase tenfold once the electrified piece of wood is strapped on. Everything from the string gauge, length of the patch cord, pedals the signal is being run through, amplifier, age of the amplifier tubes to speakers the amp is pushing all combine to make a very unique fingerprint for each player. Despite all these things, the electric guitar often serves a very similar role in most mainstream productions, whether it be powerful flexing power chords, soaring leads or funky staccato rhythm playing. I’d like to walk you through some techniques I have found to improve the variety of my playing and increase the amount of sonic textures that can be created with just a single instrument. Guitar is most commonly strummed with some form of plectrum or plucked with the fingers. The two techniques offer a wide spectrum of dynamics and expressivity, but can quickly be identified by the ear as guitar related sounds. Incorporating simple tools into your rig can expand your sound palate immensely and unlock a new realm of sonic possibilities. E-Bows are battery powered magnetic devices that can help a player achieve the sustained, bowing like tones of a violin or cello. Infinite sustain and amplified harmonics take the guitar out of its preconceived place in a mix and add a haunting, wailing ambience to your production. Guitar Trillers are relatively inexpensive tools that help imitate the percussive strike of a piano key, adding attack and brittleness to your tone. Guitar slides can be a good way to break away from the rigid glissando transitions between notes of a standard fretted board for smooth, floating melodies. Slides can also transcend the limitations of the fret board and help a player achieve ear-splittingly high registers. Fret board tapping can also break past its associations to 80’s hair metal and shredders to create a bright sounding keyboard like playing style. Watch performances of the Chapman Stick to truly appreciate this technique. It is also important to remember that not all notes played have to be generated on the fret board. Exploit the sympathetic harmonics of the strings to craft ghostly melodies and experiment agitating the strings on different parts of the body (plucking behind the bridge, above the nut, etc.). While pedals are certainly nothing new as part of a guitarist’s rig, dozens of new builders have popped up over the last five years or so, making handmade and boutique circuits a lot more affordable than they used to be. Everyone knows what a distortion pedal or wah wah is supposed to sound like, it’s when you start delving into stranger circuits like ring modulators or pitch shifters that starts to make your guitar not sound like a guitar suddenly possible. Resonant filters and flangers can help achieve the sounds of deep-sea creatures while phasers and delays will help your tone reach the distant cosmos. It’s important to experiment with the signal flow of your guitar and trying your pedals and different stages of the chain. Strive to coax unconventional sounds out of your circuits and finding great sounds using a combination of several pedals. There is no right or wrong answer to how to set up an electric guitar rig. Everyone is a different player who has different preferences. What is important is that you continually improve on your niche of playing that gives your playing style it’s uniqueness. Happy experimenting and happy soundscaping! 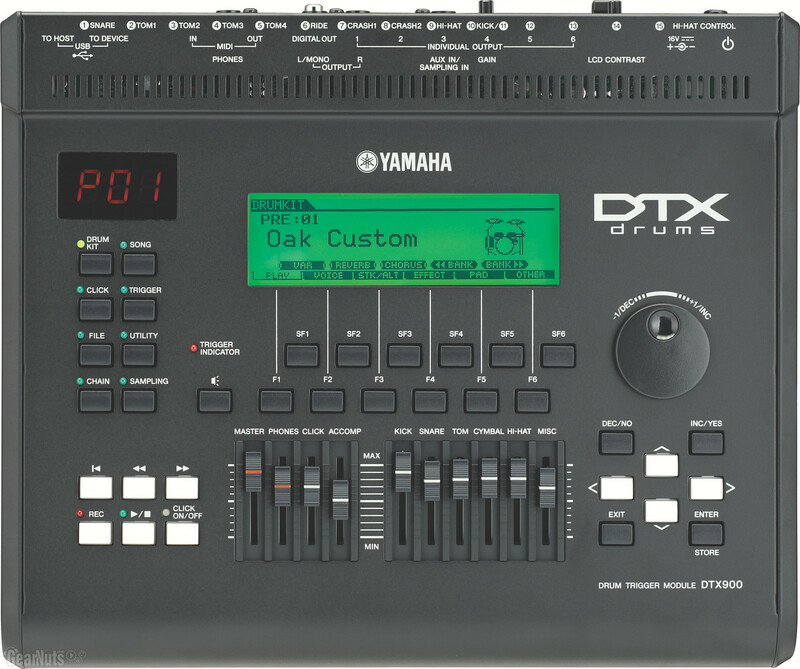 The DTX series by Yamaha is its electronic drum kit machine to imitate acoustic drums. The 900K is one other flagship kit of this series right behind the 950K. The kit boasts the evolutionary Yamaha DTX pads which the company created to allow drummers to really feel as though on an acoustic kit with all the fun and flexibility of the same. The head of the DTX pads are filled with air bubbles of a size and density that have been carefully arrayed to provide a feel that actually replicates stick rebound on a real kit. These bubbles also act as a cushion when the drum is hit, so that drummers can play for extended periods of time without worrying about arm or wrist pain. Simply put the pad encourages drummers to practice and play more, reaping the benefits of a drum that really feels great. Along with the pads the 900K also maintains the impressive PCY 135 cymbals with similar DTX pad technology and both the cymbals and the pads offer a 3-zone range for drummers. The cymbals stand out with their bow, bell and edge range hits and for the pads they replicate the 3-zone range which is the head, rim shot and rim hits. For realistic affect the cymbals have the choke effect as though muting real cymbals and to add realistic customization to the kit, the snare and tom pads have a tuning knob that replicates adding tension and pressure to a skin. The DTX 900k all functions with the use of the DTX900k brain known for its versatility and customization to the user’s preferences. The brain houses all of the kit’s functions and controls including MIDI and individual customization for each pad. Not only does the DTX900 contain the sounds of Yamaha’s major acoustic drums, the Oak Custom, Birch Custom, and Maple Custom Absolute, it also contains new drum and percussion sounds recorded by Yamaha’s engineers. The XA (Expanded Articulation) system creates natural snare rolls and is accurately recreated to the finest detail of feel in a Hi-Hat or ride cymbal. The DTX900’s effects enable you to create the original sounds that you want. These effects include reverb, chorus, 9 types of master effects, and 51 types of variation effects. In addition, you can add original sounds to a drum kit and perform with them by transferring audio data (WAV and AIFF files) from USB flash memory or by directly sampling signals received through the AUX IN/SAMPLING IN connector. Using the brain, users can switch output of the kit to a full 8 channel output or just a stereo output. For better performance, drummers can use the click track function to track and maintain their timing and play along to a library of instrumental tracks ranging from genres such as rock, funk and jazz. One new function the DTX houses in the click mode function is the groove check setting. This is acts as an educational experience for the drummer. Groove check essentially acts as a time control mechanism that reads how behind or in front of the click the drummer is playing and reads it onto the screen display. MIDI drums can also be recorded into a DAW for further editing capabilities. The brain also has the function to track, record and playback whatever the user plays by using the record function. 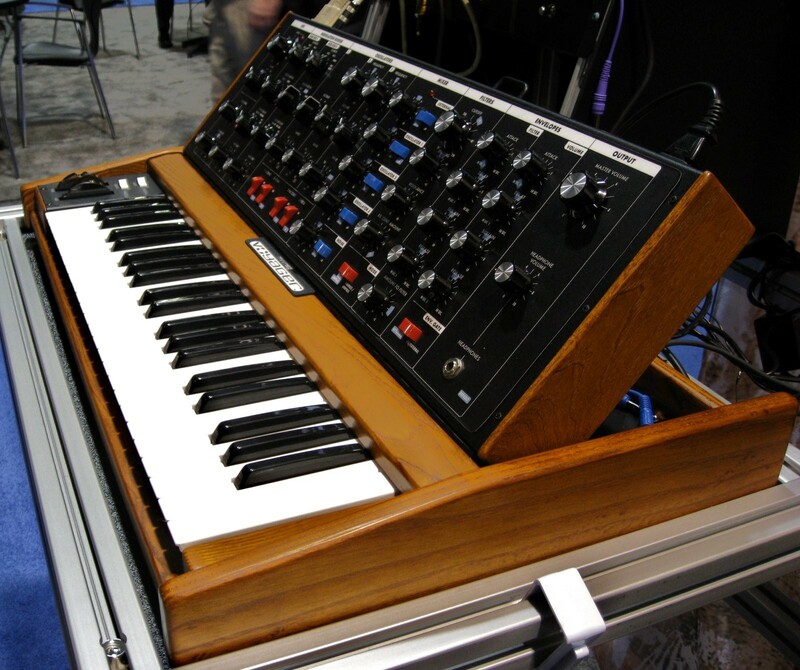 Launched in 2008, the Moog Voyager Old School is probably the only modern commercially available synthesizer comparable to the Minimoog and Model D of the 1970s. Taking the “Old School” name to heart, the Voyager OS offers a completely analogue circuit path from its keyboard input to oscillator to output. • Means by which modulation is applied, e.g. Mod Wheel, Velocity, Pressure (Aftertouch) Pressure, Envelopes, etc. Also included is CV (Control Voltage) input for a variety of sources, allowing other CV devices to modulate parameters of the Voyager (somewhat similar in concept to MIDI control messages). One of the strengths of Voyager OS is its hands-on accessibility, with all parameters at the user’s immediate disposal (compared to menus on software-supported synths). This comes at the expense of being able to instantly recall settings, so users should take special care to make note of settings that they wish to re-use in the future. o Generally only use the noise generator and apply aggressive filtering with sharp, short envelopes. Usually, offsetting the filter and volume envelopes will give a good result. o Various setting with the oscillators can lead to different effects. • The 3-1 FM switch turns Oscillator 3 into a FM modulating wave targeting Oscillator 1.
o I enjoy mapping modulation busses to either Pressure or Velocity, as it lets you instinctually “play in” your modulation, rather than focussing on running the Mod Wheel. That said, for sustained tones that will be modulated over greater times, the Mod Wheel remains highly convenient and intuitive. o Using 1-2 Sync in combination with 3-1 FM and oscillators 1& 2 in low registers (e.g. 16’ triange & 32’ square waves respectively) with a slowly building filter (via the Filter’s independent Envelope controls) gives a thick, interesting and almost horn-like bass tone, especially in lower registers. o One of the easiest ways to get dramatic, almost “out of control” sounding effects out of simply using the Modulation busses include partnering Filter and Wave destinations with a high-rate LFO controlling them. Make note of the variable AMOUNT parameter. This video was created by Brendan MacArthur as a course assignment for “Integra Contemporary and Electroacoustics Ensemble” at The University of Lethbridge (Canada). In this tutorial, I will show you how to record your performance on the DTX900K along with a user song. Recording can be done with any of the user songs (you can’t record your performance to preset songs). To capture the feel of an actual drum performance, the DTX900K provides only real-time recording, allowing you to record the MIDI data as it’s played. 1) In drum kit mode, select your desired drum kit. 2) Press the SONG button to enter the song mode. Press the F1 button to access the song play menu. 3) Press the F6 ‘kit-lock’ button so that the ‘L’ indicator appears at the top right of the display. This step is necessary because selecting a song may change the selected drum kit. 4) Select a user song to be recorded by using the INC/YES and DEC/ NO buttons and the option dial. Make sure to select a user song that doesn’t contain any data. The song must also not indicate “TR1” and “TR2” on the display. Each user song contains two tracks available for recording, but recording can only be done to one track at a time. 5) Press the REC button to access the REC standby display. 6) Set the type mode to ‘replace’ by using the INC/YES and DEC/NO buttons and option dial. When ‘overdub’ is selected as the recording type in the REC standby menu instead of ‘replace’, loop recording is enabled, allowing you to add more performance data to a track that already contains data. 7) Move the cursor to the ‘track’ option to select the track to be recorded. 8) Turn on CLICK ON if you want to use the click track. 9) Press the PLAY/STOP button to start recording. 10) Recording will stop automatically when the last measure is reached (if you specified measure length in the song play menu). You can stop recording at any time in the song by pressing the PLAY/STOP button. Press the PLAY/STOP button to hear the newly recorded song. 11) Overdubbing: Use overdub recording when you want to add more data to a track that already contains data. The overdub recording procedure is almost the same as the replace procedure except that the record type is set to ‘overdub’ and you need to press the PLAY/STOP button when you want to stop recording. When the song reaches the end of the last measure, it will automatically start again from the beginning and new data will be added to the track’s previous data.